Is train depot becoming trendy farmer’s market? Downtown Sanford may soon be getting a new development … and, no, I’m not talking about Marina Island. According ILuv Winter Park‘s Facebook page, as well as my sources here in Sanford, the old train depot located at 212 W. 1st St. (Corner of North Myrtle Avenue and 1st Street) could be the site of a trendy new retail experience. According to my sources, the project would be similar to the Plant Street Market being developed in Winter Garden and the East End Market in Orlando’s Audubon Park neighborhood. The concept is an indoor market where local farmers and small vendors offer locally-sourced produce, meats, cheeses and other food items.The concept usually includes some sort of restaurant or small event space, as well. 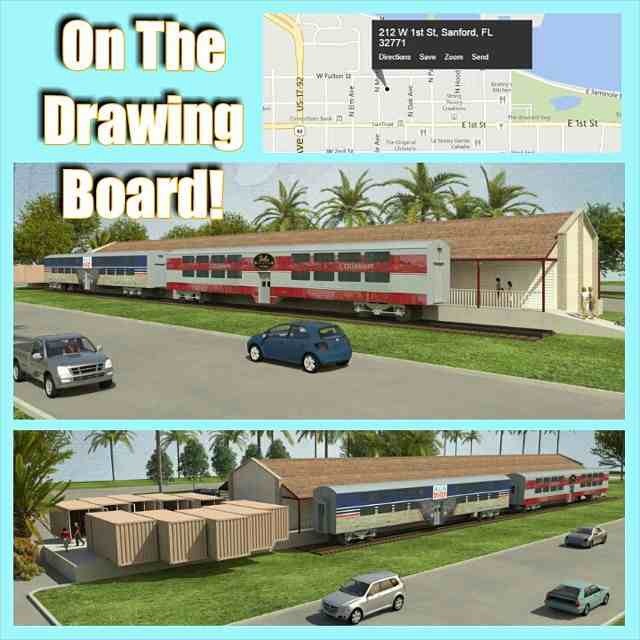 Sanford’s market would have a unique twist: additional retail space at the 4,950-square-foot train depot would be provided by using old shipping containers and railroad cars. The idea of using shipping containers as buildings has been around for at least a decade and is gaining favor with environmentally–friendly companies. In fact Starbucks has been using the containers to locate it’s coffee shops in high–traffic areas that have limited space. The coffee shops can be as small as 380 square feet. Locally, the 900 Degreez Pizza Food Truck is using a shipping container to house it’s operations. Using shipping containers for retail space in the historic downtown might be problematic, but trains at the old train depot would not only be appropriate it would pay homage to Sanford’s train history. Details are still sparse. Mike Moreno owns the property, but I have not confirmed who is proposing the project. My sources tell me that John Washburn of Washburn Imports may be involved in some capacity. Whether that’s as an investor or as a conduit for some other investor and/or investors I don’t know at this time. ILuv Winter Park says the project is projected to open in the first quarter of 2015.